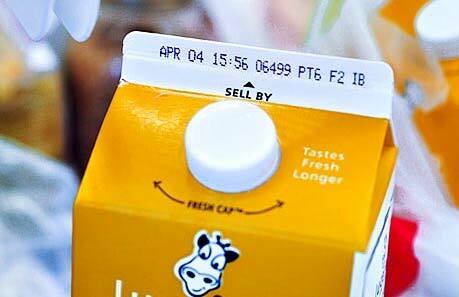 Here’s a surprisingly little secret about the sell by, use by and best before by dates you see on food products. Those dates do not indicate the safety of your food, and generally speaking, they’re not regulated. Here’s what you need to know and importantly, how you can help us at NRDC and the Harvard Food Law and Policy Clinic clear up the confusion. If this is news for you, you’re not alone. In fact, according to one industry study, 90 percent of Americans at least occasionally throw food away prematurely because they mistakenly interpret the sell by (or use by) date to mean their food is unsafe; 25 percent do so every time. In the UK, they’ve estimated about 20 percent of food wasted in households is due to confusion over sell by dates. If this same estimate were true here in the U.S. , it would mean the average household of four could be spending $275-450 on discarding food that is perfectly fine, just because they misinterpret the label date. 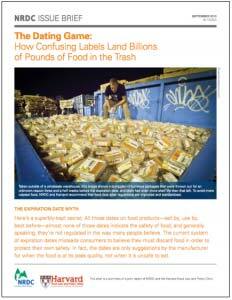 In partnership with the Harvard Food Law and Policy Clinic, my organization, the NRDC released a report called The Dating Game: How Confusing Food Date Labels Lead to Food Waste in America. We took a deep dive into the intricacies of the sell by and use by date labeling laws in the U.S. After all that, I can tell you this: The U.S. food dating system is not a system at all. It’s a mess. And that mess is leading to a whole lot of perfectly good food going to waste. Should the product have a sell by or use by date displayed at all? Their retail customers might demand this of them, otherwise it’s up to them. Which words to use? Will it be “use by” or “best before ”or even “sell by?” Up to them. What does the date convey? Is it that the taste might change a little, or perhaps the color, or do they just want you to see it as a fresh product even if it will last quite a while longer? There’s no definition, so in fact, a range of factors can feed into this decision. How is the sell by or use by date calculated? They might use lab tests, do consumer taste tests, look at literature values, or just sales data. Anything goes here. You might think that there is similarity in the sell by and use by dates at least across orange juice brands, so that when you’re looking at two containers of orange juice, the dates are comparable, right? Nope. Not the case. 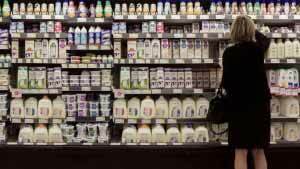 Go into your favorite grocery store and peruse the milk section and its dates (or OJ, I just happened to do it with milk not all that long ago). At Trader Joe’s, I found milk with no words, different words, and different types of sell by or use by dates, all within the same Trader Joe’s brand. In fact, even the half-gallon and quart of the same fat free milk had different dates. Seriously? How are these things supposed to mean anything? The problem is that when there’s that much variation, they don’t. And yet somehow, we all operate on the premise that those sell by or use by dates know better than we do whether our food is still good to eat. So as consumers, the most important thing we can do is handle our food safely. Both business and government can be partners in this by providing education, but also by helping to make our food dating system more intelligible. We need a reliable, coherent, and uniform system of date labels that actually communicates what the dates are trying to convey. You can learn more about the changes we recommend at www.fixfooddates.com, and even find a neat infographic demystifying those little levers on your fridge drawers. You can also help us collect examples of confusing dates by sending a photo of one that has perplexed you (along with a description of the product) to photos@fixfooddates.com, tweeting it to @NRDCFood, or posting it on our Facebook page. In return, we’ll make sure to help you figure out whether that product may still have some life left. From the United Kingdom, to the European Union and the United Nations, and even NRDC in last year’s food waste report – every entity that has investigated food waste has highlighted reducing confusion around food expiration dates as one of the key ‘low hanging fruit’ opportunities for reducing food waste. Let’s turn that opportunity into action. Weigh in: What other ideas do you have for clearing up the confusion? Want to learn more about the food dating system? Watch below for Dana Gunders’ speech on expiration dates at the Northern California Recycling Association. All this discussion about the expiration dates on milk and OJ. is more easily solved by just sniffing an open container. That’s what I do every time and it’s 100% proof if safe or sour. Dating is just not scientific enough to justify its use. Just let your nose do the talking; and you can always get a complete refund by returning the remainder of milk or O.J. when your sniffer has detected a foul odor, regardless of expiration date. I’ve returned many a milk carton with a putrid odor on the day before expiration, and always had it replaced with a fresh supply of milk. BTW always look in the rear of the cooler when buying milk or O.J. because that’s where the freshest containers go. Absolutely. Sniffing works well for those products. And even when milk gets sour, it can be used as a substitute for buttermilk in baking cornbread or making pancakes. The more attention to this issue the more states will act. Manufacturers would rather have a national standard rather than face a patchwork. It would only probably take California to lead the way on this, and I’m surprised they haven’t. Probably the food lobby is just so strong. That said, it is kind of problematic because storage conditions vary. There would have to be a standard test, like is done by EPA for mileage or DOT for crash testing. If you store a canned good in a hot vs. cool environment, or use a regular refrigerator vs. one with a separate compressor for both freezer and refrigerator compartments, food will stay fresher in the refrigerator compartments. And what about produce and frozen foods? Maybe these ‘use by’ and ‘best by’ statements are in fact not claims FDA or USDA should be involved with, but could be considered environmental marketing claims subject to the Green Guides. In effect, these claims might be considered a new category, namely “recycle by” or “compost by” dates, where the recycling or composting takes place in your body as part of the carbon cycle. Great ideas, Mark. I think it’s unlikely we’ll see the method for establishing the dates codified into regulation because products vary so much. But, what we can do is standardize the language and the intended meaning behind that language, so that consumers know something like “best by” is only a suggestion of quality, but does not have safety implications. Likewise, another phrase could be standardized for the few products that DO have safety implications associated with the date. Also, what might help is mandatory ‘packaged on ‘or maybe for produce ‘harvested on’ dates (in addition to lot numbers for packaged foods). I would think this date would be important in the event of a contamination incident or recall. It would help consumers judge a little better. Sometimes this date is provided. That might be an easier pill for legislators to swallow to start the process. Is it possible that Manufacturers are pulling the “sell by date” back to increase inventory turnover and in turn increase the amount of product sold? It would be a logical strategy from any manufacturers perspective, of course the retailers would feel the opposite way. A good indicator would be to compare the “sell by dates” for products where the channel is controlled by the retailer to those products where the channel is controlled by a manufacturer primarily. If the sell by date is positively correlated to the amount of manufacturer control the solution is obvious; require the “sell by date” be controlled by the retailers. First of all, Dana, thank you so much for this eye-opening piece. It’s a shock to have the rug pulled out from underneath you when you think you’ve understood a system, but then come to find that it is complete hogwash. I, for one, have relied heavily on these ‘dates’ ever since I can remember. But I also come from the sniff and shrug camp, too. My mom is famous for cutting mold off of cheese and bread before consuming the edible parts and I’ve followed suit. The irony is that the mold probably occurred BEFORE the ‘sell by’ or ‘best by’ dates. So there really are other variables at play and the stamp on the product means nothing. What frightens me are the broader implications of this messed up system – the fact that supermarket owners and employees rely on these arbitrary dates. 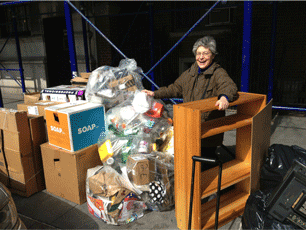 And as a result, the stuff is simply tossed – wasted, not even given a chance. It’s a preemptive measure. They’re anticipating consumers will reject these products, but they also probably believe them to be inferior as well. The image of hundreds of containers of hummus thrown into a dumpster, as depicted on the cover of the NRDC issue brief, haunts me. Most ‘normal’ shoppers might not even think about what happens to all of the food that isn’t purchased in a ‘timely manner.’ I do. What goes on behind closed doors and inside of dumpsters is astonishing. It comes as a great relief to me that this is something we’re even discussing. The perceived quality of ‘dated’ goods results in mass waste, and it truly is sickening. I think what may be overlooked is the economics of one lawsuit for an illness caused by eating food past any kind of date on a package. Large retailers have gigantic in-house claims departments that do nothing but process and settle consumer claims for any in-store or other injury caused by a product. Even when the product is not made by them, the retailers get sued. In the case of policing dates of foodstuffs on the shelf, while some products have manufacturer or distributor support in their stores to weed out dated food, some have the entire burden themselves, depending on the food. I doubt when you are a retailer and weigh the economics of settling one food poisoning case, whether real or “imagined” based on purchasing and consuming spoiled food or food past it’s “date”, that any retailer would find it economical to keep food past the “date” on the shelf. 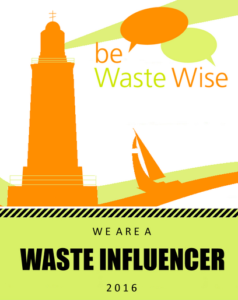 It may be sad in terms of waste, but if the issue is human health, why take a chance? I think one person sickened or badly injured – or worse – from food past any stated “date” on it is one too many, and waste should, and probably always will, take second place to health. I would first like to address Jeremy’s point that a good place to start would be to have a objective system that regulates the manufacturers objectively. This does not follow the reasoning of effective policy. When forming policy that affects business one must regulate as close to incentive as possible. The further away from the entity with incentive one regulates the less effective the policy. Thank you Dana for writing this article and the corresponding report! The rates at which people mistakenly throw away unspoiled food is alarming and the worst part is it’s all due to a simple misunderstanding. I’m not sure people realize that oxygen is actually one of the main responsible factors for food spoilage. When things are sealed up properly or are still unopened, oxidation cannot take place and therefore it does not matter what the “Use By” date is. The best example of this is eggs. Eggs do not spoil (or just take a really, reaaaally long time to spoil) because the shell locks in the content from outside oxygen – it’s mother nature at her best. If all else fails, the sniff test is always my go-to! FDA website says to use eggs within 3 weeks to assure the best quality. It does not state within 3 weeks of what, so presumably it means within 3 weeks of purchase. Thus, it tacitly acknowledges albeit indirectly, not to be concerned with the “date” on the egg cargon. However, FDA has information on buying, storing and serving safe food, including safety tips for surplus,salvaged and donated foods. Foodborne illnesses are generally not caused by food that spoils in the refregirator, let alone food past its “date”. It’s far more important to watch what and where you buy and handle food properly in the home. 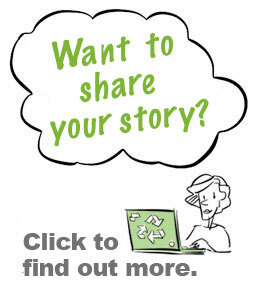 “According to figures from the European Commission, up to 100 million tonnes of food are wasted in Europe each year, while last year’s report from the London-based Institution of Mechanical Engineers found that between 30 percent and 50 percent of the food which gets to supermarket shelves is wasted – often because of poor understanding of best before and use by dates. I love this article! I was unaware of the staggering statistic about how many people throw away perfectly good food and the amount of money that translates into. I do understand the difficulty that comes with changing the system from how it is now, but even sharing this information with people that are unaware (like I was before) and listing websites like http://www.fixfooddates.com can help to create a more consistent language for this food date issue. I think we should be more concerned with problems within the food system that allow companies to skip cleaning their equipment until it is discovered that their product is contaminated with things like salmonella and e. coli. I don’t believe food dates are nearly as much of a concern and I myself will be much more hesitant to throw away food because it’s “bad” from now on. As someone who has checked sell by/use by/best before dates religiously since childhood, (and who has probably wasted a ton of food in the process), this article was a real eye-opener. The dates printed on food packaging had always been a source of reassurance to me and were part of a system that I had gotten used to and never really questioned. If something was still in the fridge past its use by date, chances are it would have been disposed of not long after — sometimes without even giving it a sniff, because I trusted the numbers more than my own nose. From now on, I’ll keep a more careful eye on what food I’m getting rid of. And food is cheap: A box of Triskets for 50¢! How amazing – the real answer to this ‘use-by’ date vagueness lies in developing a scientific measure of a food’s decay like this. The only setback is the cost, but as the article mentions, the small extra cost for these labels is nothing compared to the amount of money lost in wasting perfectly good food! This article grabbed my attention as soon as I saw the title. I was always very confused by the fact that some products have sell by dates, when some have use by dates instead. I never really understood why there was no standard for all food to have these dates. I believe that these dates should be used to the employees of the food stores so they are aware of how long food has been sitting on the shelves. However, the accuracy of the use by dates for us consumers is very difficult to interpret. Different foods spoil faster than other foods, and the dates put on specific products are not completely accurate. Instead of relying on these dates, consumers should be more proactive in making sure they utilize the food they have purchased before it spoils. The luxury of having food in a refrigerator is one thing, but having the luxury to let this food go bad and throw it out is a luxury that people in different parts of the world probably cannot even fathom. What these dates come down to the consumer responsibility. Consumers must act responsibly in terms of how quickly they use everything they buy. This article perfectly captures the difficulty consumers face in making the right decision when information is hard to come by. Food and nutrition, where knowledge changes and advertising influences buyers, suffers from this dilemma greatly. Many consumers simply give up, overwhelmed by contradictory messages and an overabundance of options. The key challenge for reformers then becomes offering yet another alternative, but in a way that simplifies the problem and generates confidence. Any thoughts on how to promote change without adding to the noise? This is a very interesting article. Even though this was written in 2014, it is still relevant today. Many people have no knowledge of where their food comes from let alone the shelf life of it. Consumers need to start looking into not only the shelf life of the food but also where it comes from. Many consumers are unaware that factory farming exists and even what GMO’s are. This is an issue because then the waste produced by the meat industry as well as the pollution is not on the consumer’s radar because they are unaware of where their food comes from in the first place. What consumers should be educated on is that sell-by dates are more for the grocer’s benefit than it is for the consumer. It is impossible for the staff at a supermarket to sniff all the meat/cheese/milk – there wouldn’t be enough hours in a day! However, once the product has reached my home, I think the sniff (and sometimes taste) test is still the way to go. Important to keep in mind that products can still go bad way before its sell-by date.